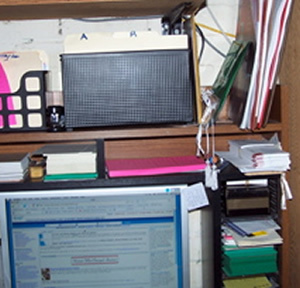 The owner and a staff member were working on their computer in the back room when a box holding order forms fell off the top shelf of a computer desk, but nothing else on the desk moved. 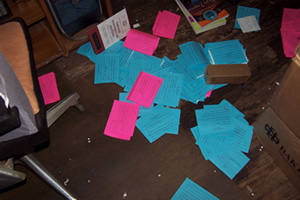 The order forms that fell normally between the small green plastic folder and the clipboards on the right side of the desk. As you can see nothing else on the desk fell over. Horton's Books and Gifts is the oldest book store in Georgia and the oldest business in Carrollton. 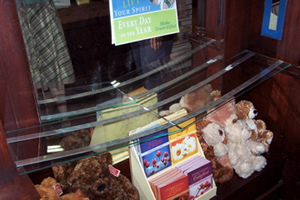 The store opened in 1892 under the ownership of N.A. Horton. N.A. 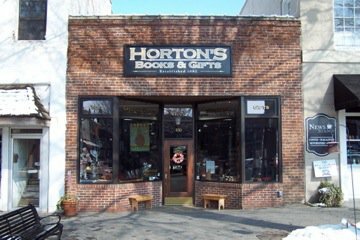 Horton and his wife owned the book store and they lived in the basement. The Horton's ghost answers to the name Mary Melinda who was the first wife of the founder. N.A. Horton was due to give birth to their first child and at birth she and the baby died. Many times a woman holding a baby has been seen and caught on film. She wanders the store and the basement, turning lights on and off and knocking books on to the floor. Some even say you can hear the baby cry at night. The store will not stay open past dark and they can't keep workers due to this ghost. I myself have caught her on flim holding her little baby in her arms. I was in Hortons one day and I was just standing there and a stuffed toy didn't fall off the shelf it looked as if it was thrown into the middle of the floor.